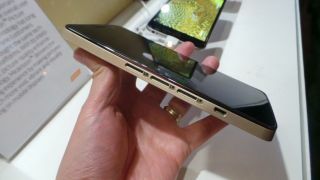 A reference smartphone design from Mediatek. Chinese chipset designer Mediatek used MWC 2015 to unveil a powerful new system-on-chip, the MT8173, which is based on the ARM Cortex-A72 architecture. The latter was only announced last month by the British technology company but we can reveal that Mediatek and ARM have been working on the project for nearly a year, according to sources within the company. Mediatek has also confirmed that the chip has already started shipping to select customers and that products based on the MT8173 will be available in the second half of 2015. The company had a working reference smartphone and reference tablet at its press briefing earlier today. Hardware-wise, it packs two A72 and A53 cores in a big.LITTLE architecture and clocked at up to 2.4GHz. One particularly interesting tidbit in the presentation pitched the MT8173 against Apple's A8X, its most powerful system-on-chip that powers the iPad Air 2. According to Mediatek, the MT8173 has a higher SPECint 2000 rating than Apple's; that benchmark, though not popular, is used frequently among engineers. When it comes to graphics performance, it integrates an Imagination PowerVR GX6250 GPU which is no match for the GXA6850 that Apple's top-of-the-range tablet sports.